Latest Development: Uber Technologies Inc. faces a nationwide class action alleging the company illegally classifies its drivers as independent contractors and cheats them out of overtime wages and tips. Potential Impact: The action could compel the courts to clarify whether gig economy companies such as Uber, Lyft, GrubHub, Upwork, Fiverr and Thumbtack can characterize their workers as independent contractors or traditional employees entitled to protections under federal labor laws. Uber, fresh off its $100 million settlement with drivers in California and Massachusetts, now faces a nationwide class complaint alleging it illegally classifies drivers as independent contractors and cheats them out of overtime wages and tips (Trosper v. Uber Techs. Inc., N.D. Ill., 1:16-cv-04842, complaint filed 5/1/16). 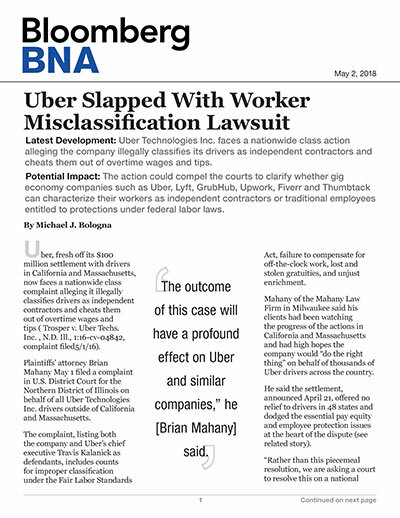 Plaintiffs’ attorney Brian Mahany May 1 filed a complaint in U.S. District Court for the Northern District of Illinois on behalf of all Uber Technologies Inc. drivers outside of California and Massachusetts. The complaint, listing both the company and Uber’s chief executive Travis Kalanick as defendants, includes counts for improper classification under the Fair Labor Standards Act, failure to compensate for off-the-clock work, lost and stolen gratuities, and unjust enrichment. Mahany of the Mahany Law Firm in Milwaukee said his clients had been watching the progress of the actions in California and Massachusetts and had high hopes the company would “do the right thing” on behalf of thousands of Uber drivers across the country. He said the settlement, announced April 21, offered no relief to drivers in 48 states and dodged the essential pay equity and employee protection issues at the heart of the dispute. “Rather than this piecemeal resolution, we are asking a court to resolve this on a national basis,” Mahany told Bloomberg BNA in an interview May 2. The settlement agreement, which still requires the approval of the court, requires Uber to pay as much as $100 million to drivers in California and Massachusetts and permits the drivers to solicit tips from riders. But the agreement lacks the kind of labor law clarity that has angered critics of gig economy models, permitting Uber to continue to classify its drivers as contract workers instead of formal employees. In settling the action, Uber continued to tout its nontraditional business model as a benefit to drivers. “Drivers value their independence — the freedom to push a button rather than punch a clock, to use Uber and Lyft simultaneously, to drive most of the week or for just a few hours,” Uber said April 22. Mahany insisted his action would penetrate those questions on behalf of his clients and offer some clarity to other gig economy workers toiling on behalf of companies such as Lyft, GrubHub, Upwork, Fiverr and Thumbtack. “The outcome of this case will have a profound effect on Uber and similar companies,” he said. Mahany said Uber can’t hide behind the independent contractor moniker because it actively “micromanages” all aspects of its drivers’ professional lives in ways that should designate it as a traditional employer. Uber issued a statement May 2 that didn’t respond directly to the charges in the suit but stressed the importance of the independent contractor designation.